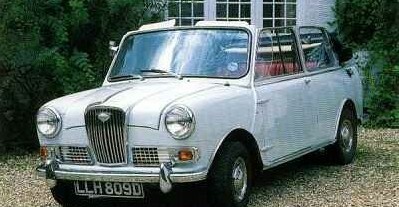 Following the outstanding success of the Mini, which had been introduced in 1959, BMC released two further variations on the theme in the Autumn of 1961. 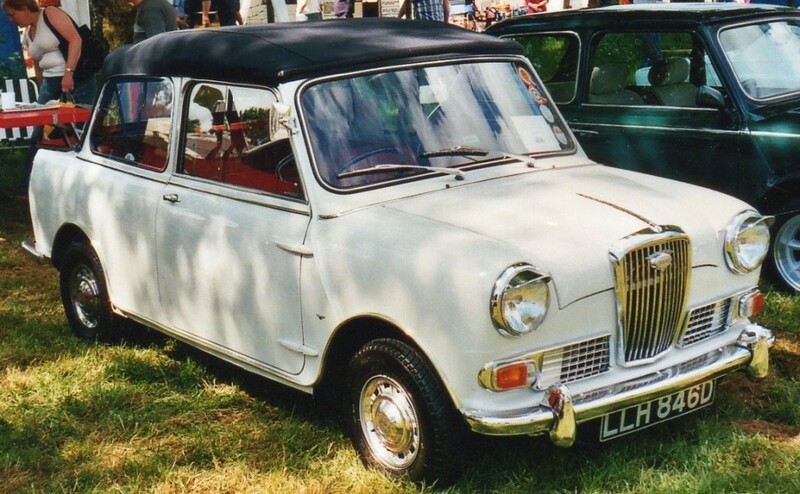 The Riley Elf and Wolseley Hornet were built around the same winning basic structure, but the body was lengthened by 8.5 inches to provide a “proper” boot, which increased luggage capacity by a very useful 2.5 cubic feet. The “Hornet” name evoked memories of more sporting Wolseleys from the 1930s, but this little gem had no such aspirations. 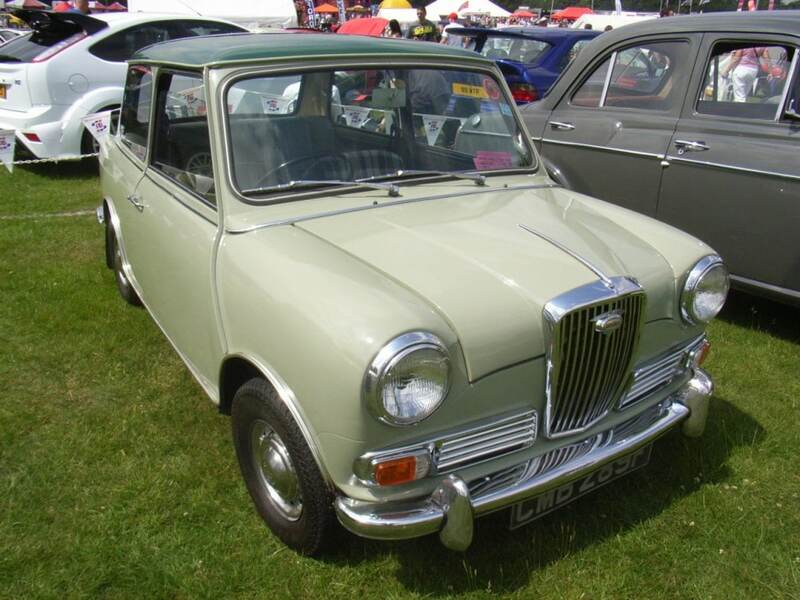 In addition to the boot, the car boasted the traditional Wolseley grille (with mandatory illuminated badge), more luxurious trim, better sound deadening, and an oval instument nacelle with wood veneer finish. The only change to the specification in the model’s first incarnation was the introduction of a baulk-ring synchromesh gearbox in late 1962. In March 1963, a Mk II version was introduced. The principal, and very welcome, change was the installation of the new 998cc version of the ‘A’ series engine, which resulted in a 12 per cent increase in peak power – 38bhp as opposed to the somewhat puny 34bhp of its predecessor. Performance was discernibly livelier, and fuel consumption, too, was greatly improved. Another significant change took place 18 months into the model’s run, when the car was fitted with Moulton’s acclaimed Hydrolastic suspension. This gave the little car a far smoother ride in comparison to the original rubber cones. In October 1966, the Mk III Hornet was born. The mechanical specification remained unchanged, but the car’s aesthetics were enhanced considerably by the removal of the external door hinges, plus the introduction of proper wind-up windows in place of the rather crude sliding efforts with which all cars in the Mini range had been hitherto afflicted. In-car ventilation was improved by the provision of ‘eyeball’ fresh air vents at either end of the dashboard. The car also inherited the neat remote control gear change from the Mini Cooper, and an automatic option was offered from late 1967. The model soldiered on unchanged until its demise in 1969. A total of 28,455 Hornets of all types were built, and over 400 remain “taxed” in the UK to this day. In 1966, the renowned food manufactures, H.J. Heinz, famous for their “57 Varieties”, ran a competition in which the purchaser of one of their products could fill in a competition entry on the label of the can with the a lucky winner becoming the proud owner of a delightful little car which became known as the “Heinz 57 Wolseley Hornet Convertible”. Profit margins in the food industry must have been very substantial in these halcyon days, since no fewer than (funnily enough) 57 were given away! To create these little beauties, the specialist coachbuilders, Crayford Engineering of Westerham, Kent, took delivery of original cars from the manufacturer and turned them into full blown convertibles. The package included built-in, fully insulated food cabinets, electric kettle/point, picnic hamper, tartan travelling rug, fitted radio, and, to keep the ladies looking good, an integral Max Factor make-up tray! To assure passengers’ safety,seatbelts were fitted front and rear. Two colour choices were offered-Birch Grey or Toga White, with Cardinal Red leather upholstery. The cars had consecutive registration numbers: LLH 8..D, and it is rumoured that 41 of the original 57 still exist.